OMB REVIEW - November 17, 2016: Town Hall Meeting at Port Credit Legion (only session to take place in Mississauga). TOPCA reps attended this latest public consultation to provide input and learn about possible changes, which we believe require more than "tweaking". 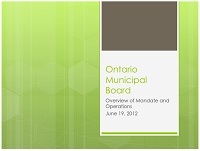 ► Click for the provincial OMB Review webpage which includes all materials. ► TOPCA sent a formal written SUBMISSION (2p PDF) on December 19, 2016 to the Ministry of Municipal Affairs. February 11, 2013: Kathleen Wynne has now been sworn in as the Premier of Ontario, and further to her 2012 consultation on OMB reform as Minister of Municipal Affairs & Housing, we trust she will pursue this critical policy issue with Mississauga South MPP Charles Sousa's continued support. COUNCIL MOTION: March 27, 2013 - Council unanimously passed a Motion concerning a proposed amendment to the Planning Act to provide more planning autonomy to Ontario municipalities which have a provincially approved Official Plan (as Mississauga does). 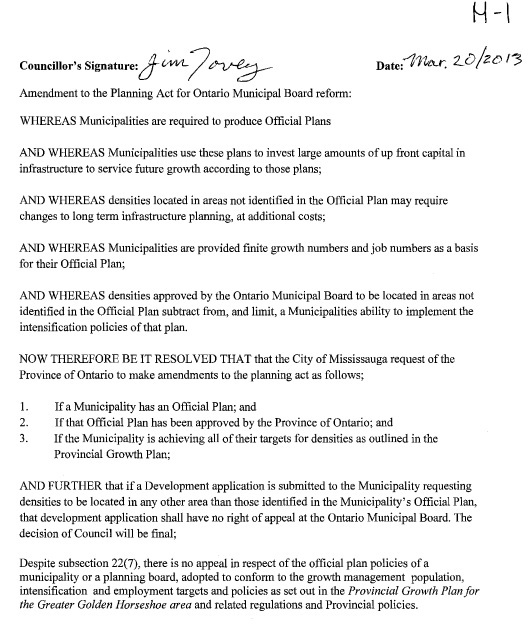 ► Click image to view the full-size Notice of Motion - March 20, 2013 put forth by Councillor Jim Tovey (excerpted from page 100 of the March 27, 2013 Council AGENDA). MINISTER'S ROUNDTABLE ON OMB REFORM: TOPCA was represented at Municipal Affairs Minister Kathleen Wynne’s Roundtable on reform of the Ontario Municipal Board (OMB) as part of the land use Planning System. The Roundtable was convened in Toronto on June 19, 2012. 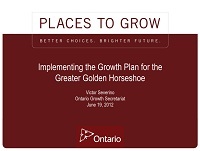 ► TOPCA followed up with the Minister in a Letter: July 17, 2012 (4p PDF) which summarizes the discussion and outcomes of the meeting, including Key Themes and the proposed Solution by Roundtable meeting participants, as endorsed by the TOPCA Executive. ** UPDATE ** MINISTER KATHLEEN WYNNE'S FOLLOW-UP: On October 1, 2012, Municipal Affairs and Housing Minister Kathleen Wynne wrote to the participants of the Roundtable on the Land Use Planning System (June 19, 2012) and provided a summary of the meeting notes, the flipcharts and the group discussions. ► View the Letter: October 1, 2012 (1p PDF) from Minister Kathleen Wynne. ► View the Summary document (9p PDF). 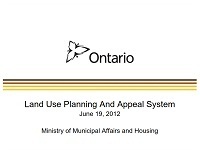 The overwhelming consensus of the meeting supports reform of Ontario's land use planning system (including the OMB). The Minister's Roundtable included 30 representatives from the development industry, the Association of Municipalities of Ontario (AMO), citizen groups, NGOs and former politicians. The Minister indicated that significant, meaningful transformation of the OMB is necessary. ► In advance of the meeting, the reps were sent an Invitation and Background (2p PDF) as well as the Agenda and Terms of Reference (3p PDF) for the Roundtable. ► The following three (3) contextual Presentations were made to the reps at the meeting to assist in their deliberations (click to view the 5p, 6p and 11p PDFs). ► TOPCA followed up with the Minister in a Letter: July 17, 2012 (4p PDF). Excerpt: "SOLUTION: At the end of the day, few participants demanded total abolition of the OMB, and many supported its continuation in parts of rural and northern Ontario, but most working group summaries described variations of a simple amendment to the terms of reference for the Ontario Municipal Board: The OMB shall not review or impose amendments to provincially approved Official Plans, Secondary Plans or zoning by-laws. As in other North American jurisdictions, recourse to the courts will be limited to appealing constitutionality or to set damages. Two practical suggestions emerged from group discussions to make the solution work...." Read more. REFORM OF THE ONTARIO MUNICIPAL BOARD: Mississauga South MPP Charles Sousa made a long-awaited announcement at the THREE VILLAGES PUBLIC MEETING sponsored by TOPCA, LRA and Clarkson RAs on May 7, 2012, as reported (see sidebar article). A Ministerial Roundtable on OMB reform will be conducted to consider the options. TOPCA POSITION: The TOPCA Executive notes that the City of Mississauga has a new Official Plan (approved in 2011, and currently under appeal at the OMB) that truly reflects the aspirations of the residents through an extensive public consultation process (including input to the City’s inspirational Strategic Plan), and is developing Local Area Plans (including the Port Credit Local Area Plan) in synch with the new OP, which fully complies with provincial Smart Growth mandates. We expect Council to support and defend the new OP (even at the OMB) and to continue to advocate for the City of Mississauga’s right to self-determination on planning matters via reform of the OMB. NOTE: We called on all Mississauga candidates in the recent provincial election (October 6, 2011) to declare their position on this issue (see sidebar article). 'pl060319' in the search box). ► The Haig Blvd. condo townhouse proposal in Lakeview: July 25, 2011 OMB Decision. Clarkson: August 2, 2011 OMB Decision. MPP STATEMENT: Statement on the OMB by Mississauga South MPP Charles Sousa (August 22, 2011) -- Excerpt: "Many residents have shared with me their concerns about the Ontario Municipal Board (OMB) and some of their recent decisions that affect our local community. Some have even called for the OMB to be abolished and for zoning appeals to become the jurisdiction of the divisional courts. ... 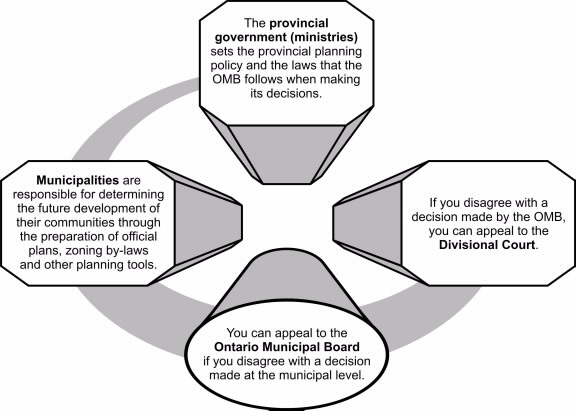 The Ontario Municipal Board (OMB) is an arms-length, quasi judicial body that has been a component of the planning system in Ontario since 1897. It’s where Ontarians can go to challenge a municipal or provincial planning decision at little or no cost. OMB decisions are not final, however. All decisions can be appealed to divisional court. ... A draft proposal to amend the Planning Act is also being prepared for City Council’s review. The proposal would prevent City decisions from being appealed to the OMB if those decisions conform to the Official Plan. In essence, it would further minimize the use of the OMB process when an official plan is already approved." COUNCIL RESOLUTION: On June 22, 2011, Mississauga Council unanimously passed Resolution 0172-2011 that the Minister of Municipal Affairs and Housing be requested to amend the Ontario Planning Act to abolish the Ontario Municipal Board (OMB) for reasons given in the Resolution, and to provide that decisions of municipal councils are only appealable to the courts on questions of law. "AND WHEREAS it is manifestly undemocratic for an appointed board such as the OMB to substitute its opinions for the considered judgement of elected councillors on matters affecting municipalities in which the councillors will continue to live and in which the OMB has no ongoing presence”. The Resolution further requests that appeals of decisions of the Committee of Adjustment be appealable to municipal councils and that municipalities be authorized to conduct hearings on such appeals through a Committee of Council, if deemed appropriate to do so by the municipality. ► Mississauga News article (March 27, 2013): City wants to limit appeals to OMB. Excerpt: "The City of Mississauga is asking Queen's Park to make it impossible for Council decisions to be appealed to the Ontario Municipal Board in certain cases. Councillors passed a motion today calling for changes to the Planning Act that would limit the ability to appeal to the OMB over decisions made at the municipal level. ... a sophisticated and mature city such as Mississauga, with staff well-versed in planning and legal matters, doesn't need it [OMB]coming in and reversing City decisions." ► Mississauga Business Times article (Nov. 2, 2012): Consensus: It's not cool to mess with Official Plans. Excerpt: "Residents of villages like Clarkson, Lakeview, Port Credit and Streetsville, and particularly members of taxpayers' associations, have come to fear just in the past two years that their significant input — solicited by an engaging City — into the directives of Mississauga's Official and Master plans will be mooted and muted each time a developer bucks them by launching an OMB appeal." OMB reform in months, not years: Sousa. Excerpt: "Ontario Municipal Board (OMB) decisions that go against City of Mississauga plans and the vision of residents will soon be a thing of the past, Mississauga South MPP Charles Sousa told a packed house last night at the Port Credit Legion. Speaking at the Three Villages Public Meeting, hosted by residents groups from Clarkson, Port Credit and Lakeview in the continuing fight to keep the Lakeshore Corridor free from what they view as inappropriate development, he said it's essential to rein in the OMB, and 'that will happen in months, not years.'" Scrap the OMB, candidates say. Excerpt: "There was a rare moment of cohesion last night during an all-candidates debate in the riding of Mississauga South. All it took was a question about the Ontario Municipal Board (OMB) to bring the candidates together during the debate held at Clarkson Secondary School. ... Most of the candidates who attended agreed that the provincial organization that provides mediation on land use and planning issues needs to be abolished or reworked." Excerpt: "The motion also stated that, 'it is manifestly undemocratic for an appointed board such as the OMB to substitute its opinions for the considered judgement of elected councillors on matters affecting municipalities in which the councillors will continue to live and in which the OMB has no ongoing presence.'" Excerpt: "[Councillor Pat] Mullin told the Star the timing is right for the motion, with the provincial election coming up this fall. It will be circulated to cities and towns across the province before the August meeting of the Association of Municipalities of Ontario." Mississauga council urges province to scrap OMB. Excerpt: "Mississauga council is calling on the province to abolish the Ontario Municipal Board, citing a need to 'take back' planning powers from the hands of an unelected agency."